Over the last several years, diabetes has been growing in affected population. According to the American Diabetes Association, about 24 million Americans (8 percent of the United States population) have diabetes. This is an increase in 3 million in approximately 2 years. With this growth, complication have become more rampant in the United States and affect many parts of the body, but especially the feet. A small problem in a healthy person's foot could become a severe one to a diabetic. Diabetes can affect the feet in a number of different ways. One is a decreased immune response. This reduced immune response may lead to poor wound healing or the inability to fight infections. Infections are one of the most common reported complications of the diabetic foot. Early infection treatment is imperative to success. If neglected, an infection of the foot can cause gangrene, ulceration, osteomyelitis (bone infection), and even amputation. Another complication of diabetes is poor functioning of the nerves. This is called neuropathy and presents in two ways: 1) Decreased sensation to pain and temperature, that may present as burning, stinging, numbness, shooting or aching pains. This may cause a patient to underestimate a foot problem, due to lack of regular pain. This may also lead to poor balance, as you don't feel the normal pressure to the feet. 2) Nerves to the skin malfunction causing a decrease in perspiration or oils released to the skin. This may lead to dry, cracking skin that can more easily become infected. The third complication of diabetes is poor circulation to the feet. This can also lead to wounds or non-healing, and makes the diabetic at higher risk for infection. Of these complications, foot ulcers are the most problematic to the feet. Foot ulcers are local skin defects with inflammation or infection. They can be caused by lack of circulation, infection, lack of protection, and improperly fitting shoes. A break in the skin without proper treatment may become an ulcer. Diabetics are at higher risk for developing foot ulcers. With a diabetic foot, a wound as small as a blister from wearing a shoe that's too tight can cause a lot of damage. Decreased blood flow from diabetes will often cause injuries to heal slowly. When your wound is not healing, it's at risk for infection. As a diabetic, your infections spread quickly. If you have diabetes, you should inspect your feet at least every day, preferably twice a day. Look for puncture wounds, bruises, pressure areas, redness, warmth, blisters, ulcers, scratches, cuts and nail problems. Get someone to help you, or use a mirror. Diabetic foot care can be very complicated and good podiatric care is an essential component of managing diabetes. 1. Inspect your feet at least every day, preferably twice a day. 2. Keep your feet clean and dry. 3. Always keep your feet warm. 4. Take extra care drying your feet and toes after showering. Carefully pay attention to the space between the toes. 5. Be sure to exercise. Walking is one of the best exercises for diabetics unless you have complications. If you struggle with balance use a cane. 6. Always protect your feet and legs. Never walk barefoot. Avoid hot water bottles and heating pads. 7. Do not overexpose skin to the sun. 8. If your skin is dry use moisturizing cream or lotion daily. Do not, however, apply between the toes. 9. Cut your toenails straight across and even with the skin on the end of your toes. Do not cut into the corners. If you can't see or reach your toenails have someone else do it for you. A podiatrist can often help with this. 10. Never use razor blades, knives, scissors or medicated corn/wart removers. 11. Look for redness, blisters, scratches, cracks between the toes, discoloration or any other change. 12. Avoid all actions that diminish circulation such as tobacco use, sitting with legs crossed, and circular elastic garters. 13. Change your shoes and socks daily. 14. Wear soft leather shoes that conform to the shape of your foot. 15. Gradually "break in" new shoes and avoid blisters. 16. Call us if you see any changes in your feet. Foot deformity often follows lose of feeling in the feet. One way this happens is through ulcers. Open sores may become infected. Another way is the bone condition Charcot (pronounced "sharko") Foot. This is one of the most serious foot problems you can face. It warps the shape of your foot when your bones fracture and disintegrate, and yet you continue to walk on it because it doesn't hurt. Diabetic foot ulcers and early phases of Charcot fractures can be treated simply with non-surgical measures. This is why regularly visiting a podiatrist is so essential for diabetic patients. It can prevent costly and painful surgery and even limb loss. As a diabetic, it is important to protect your feet. You deserve to continue to walk without pain or difficulties. Knowledge on how to protect your feet is important. 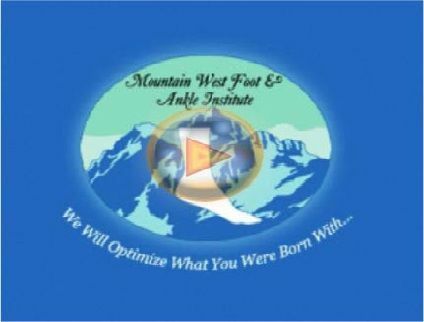 Brandt R. Gibson, DPM, MS, a state-of-the-art podiatrist in American Fork, Utah, seeks to educate all to help them "optimize what they were born with." For further educational materials and recommended medical products, visit his website at https://www.utahfootdoc.com . A free book on foot and ankle health can also be ordered at http://www.MyFeetHurtBook.com.